I was recently deploying a Microsoft Lync Server 2013 Standard Edition pool pair for a customer that was geographically dispersed. During the implementation, which was a migration from Lync Server 2010, I experienced an issue when running step 2 of the deployment wizard following the application of front end resiliency via the Topology Builder. On running the deployment wizard the following error was produced on the front end that was not responsible for holding the CMS. 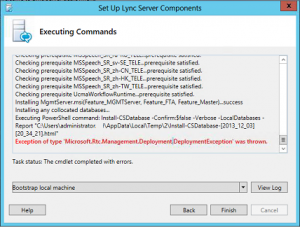 Microsoft Lync Server 2013, Backup Service central management backup module failed to register with back-end database. The module will continuously attempt to reconnect to the back-end. While this condition persists, no backup will be done. Exception:  Cannot open database “xds” requested by the login. The login failed. Login failed for user ‘NT AUTHORITY\NETWORK SERVICE’. Cause: Possible issues with central management backup module back-end database. Resolution: Ensure central management backup module back-end is functioning correctly. On reviewing the error and confirming the backup service was started, in order to resolve the issue the following actions were performed. 1. In the Lync Topology Builder remove the front end resiliency settings that were previously applied and publish the topology. 2. Connect to each front end server that comprises the pool pairing and run step two of the deployment wizard, by performing this the replicator and backup services will be removed and essentially the pairing will be broken. 3. In the topology Builder re-apply the resiliency settings and publish the topology in order to recreate the pairing. 4. Connect to each front end server that comprises the pool pairing and run step two of the deployment wizard, by performing this the replicator and backup services will be added again. Once the deployment wizard is completed, ensure the backup services are started on each front end and ensure the Invoke-CSBackupServiceSync PowerShell commands are run as per the “What to do next” information. 5. In the Lync Server Mangement Shell run the “Get-CsBackupServiceStatus -PoolFqdn yourpool.domain.local” and ensure the services is operating in a normal state for both front end servers. That’s it, the deployment wizard and associated xds database access error should now be cleared. That was exactly what I ran into, and the fix I needed! Thanks for the post.